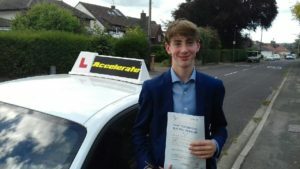 Congratulations to Monkton Combe pupil Jake Abington whom passed his practical driving test on the 1/10/18, 1st time at Brislington driving test centre in Bristol. Jake passed with only three driving faults. He did a confident drive including the forward bay park manouvere. All the best in the future from Ken your driving instructor at Accelerate driving school.